Where Will Marquez Be In 2014? 2015? 2016? Juan Manuel Marquez has been a top notch champion in boxing forever, and it seems as though the seconds had stopped ticking for Dinamita as his performance has not diminished a bit over the years. As a matter of fact, I have heard many boxing fans and analysts suggest that he has actually gotten better as he got older. Being that Marquez is 40 years old, and is performing at peak, do we have a lighter version of Bernard Hopkins on our hands? I am not attempting to compare Hopkins and Marquez, but if things keep going the way they are for Juan, I don’t foresee a retirement anytime soon for Dinamita, unless of course his family insists. His fight against Bradley has already generated a lot more interest than I had imagined it would, as it truly is an interesting match-up, but the question in my mind, is where would Marquez go from there? While there are various answers to this question, multiple directions that Marquez could take his career, would he once again be a part of a mega-fight against Manny Pacquiao or even Mayweather Jr.? I remember that after the Marquez vs. Mayweather Jr. fight, Juan stated that there isn’t anyone out there that could beat Floyd. I can understand that saying something like that, despite being a realistic statement, was probably a way for Marquez to justify the way that he was dominated by Floyd. 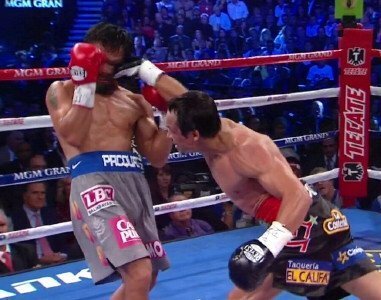 Now that Dinamita has done the unthinkable, the unbelievable, and the unpredictable by most boxing fans, knocked out Manny Pacquiao, his confidence is at an all time high, and his belief of his own abilities is sky high. Thus, why not seek another fight against Mayweather Jr.? I guess what I am trying to say, is that Marquez has the bragging rights and the resume to be just like Pacquiao was and Mayweather Jr. is: pick whomever, whenever, and wherever he wants to fight. So, what do you think will be his move if he comes out victorious against Bradley? You are here: Home / Boxing News / Where Will Marquez Be In 2014? 2015? 2016?